Saturday, July 13, 2013 - Sargodha Commissioner Iqbal Muhammad Chohan has said that relief was being provided to the masses through subsidised Ramazan bazaars. Talking to journalists during his visit to Ramazan bazaars, he said that on the direction of Punjab Chief Minister Shahbaz Sharif 40 Ramazan bazaars and 345 fair price shops had been set up in the division and �Ramazan Dastarkhawan� was a positive move to provide relief to the masses. Quetta: The provincial capital administration has decided to set up six Ramazan bazaars in the city to facilitate citizens. Official sources said on Friday that Ramazan bazaars would be set up in localities of the city including Mutton Market area, Bacha Khan Chowk, Killi Ismail, Pashtoonabad, Satellite Town and Kuchlak. 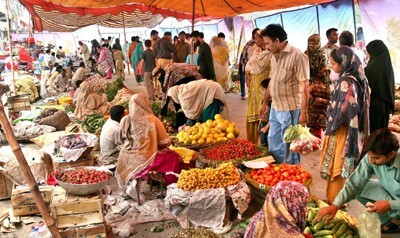 Editable items and other necessary things would be available at reasonable price in these bazaars. Larkana: Deputy Commissioner Larkana Umar Farooque Bullo, warned traders that profiteers and hoarders would be penalised during the holy month of Ramazan. He told local newsmen that prices of edible and kitchen items have been fixed by the district price control committee and the violators will not be spared at all. Multan: Provincial Minister for Prisons Chaudhary Abdul Waheed Arain has said that the incumbent government have established Ramazan bazaars to provide maximum relief to the masses during Ramazan. Peshawar: District administration Abbottabad has decided the holding of special three-day a week Ramazan Bazaar to provide cheap and quality essential food items to the people during the holy month of Ramazan. The bazaar would be held near Cantonment Plaza situated in the mid of the city on Sunday, Friday and Tuesday every week, said stated of Assistant Commissioner (AC) Abbottabad Osama Ahmad Warraich issued on Friday. Lahore: Magistrates and other officials responsible for price control will face action if they failed to ensure the sale of essential items at fixed prices in Ramazan bazaars and markets.